10-11:30am on Thursdays during school term time. For parents or grandparents and their children aged 0 – 3 ½ yrs. Come join us for puzzles, freeplay, craft, singing and so much more (including cake). Toddlers’ is a place where we seek to reflect Jesus’ love to families from our local community through providing a safe and fun environment where toddlers and their carers can find friendship and encouragement. 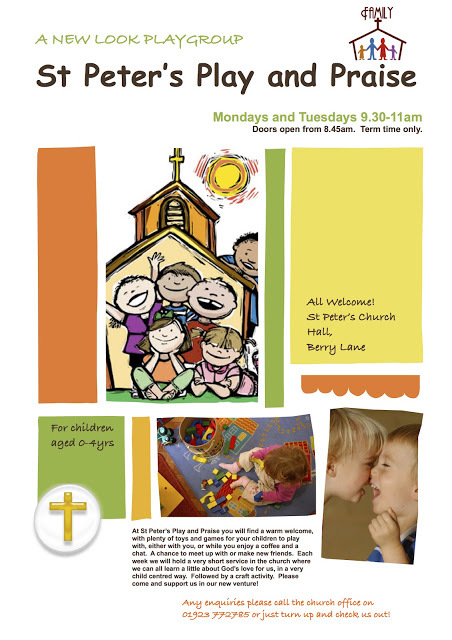 Play and Praise meets on a Monday morning – officially from 9.30am but any time after droping off children at school. It is a group aimed at pre-school aged children and their parents and carers. The session begins with refreshments and play in the Parish Hall. At 10.00am we move into the church building for ‘Song and Story’ time including a simple song and story from the Bible and a chance to praying using our Prayer Cushion (it has to be seen to be believed!) We move back into the hall for simple craft and more refreshments. No need to book! Just pitch up! More information is available below. Contact the parish office for more info.